I have been reading books by the author Joy Fielding for as long as I can remember. Her books can best be described as psychological thrillers and in most cases I have been on the edge of my seat from the moments I have picked the books up. ‘Charley’s Web’ had a slightly different feel to it though and although I enjoyed the book very much I did not really experience the usual tension until towards the very end. ‘Charley’s Web’ is about a character called Charley Webb who is a somewhat provocative journalist for a Florida newspaper. She writes a weekly column that often provokes and shocks her readers which consequently leads to a lot of interesting emails and letters. Most are complaints but alongside all her regular post, she receives a letter from Jill Rohmer, a convicted child killer awaiting execution on Death Row. She wants Charley to write a book telling the story of what happened, and even though Charley is repulsed by the crimes, she agrees to do so and starts meeting Jill on a regular basis in order to piece the story together. The meetings are often hostile and sinister and leave Charley feeling quite unsettled particularly when Jill starts alluding to an accomplice called Jack who is still at large. Obviously, as you are reading, you can’t help wondering who Jack might be and whether we might have already met him! Alongside this, Jill has a very troubled family of her own mainly due to the fact that her mother left her and her two sisters and one brother when she was only eight. Her mother reappeared in their lives a few years ago but they have all dealt in this in their own way with Charley being the only one who has anything to do with her mother. She really wants to get the family back together but it does not prove to be easy. Alongside this she has to keep rescuing her brother from dodgy situations, she is looking after a shady nightclub owner’s dog and there is also a rather handsome lawyer on the scene. To cap it all though, she keeps receiving threatening emails concerning her two small children and she really does not know who she can trust. All in all, her life is not exactly a bed of roses! It sounds a little confusing but all of these stories merge very well and culminate in an exciting and suspenseful finale. I really felt that most of the suspense came in the last fifty pages or so which made it quite different from Fielding’s usual novels that start building the suspense from the very first pages. I still found it a very enjoyable book though although at times I had to remind myself that it was a Joy Fielding novel! It is good to note though that she is not a formulaic writer and is well able to surprise her readers. There was some excellent characterisation in the book not least of all Charley herself. She was an intriguing character and changed greatly over the course of the book and I very much warmed to her as she did so. At first she was not at all likeable coming over as very opinionated and having upset virtually everyone that she had come into contact with. She changes quite subtly at first but you are suddenly aware that she has become a softer, rounder character and you do actually like and care about her after all! I found myself very caught up in the story about Charley’s family and sympathised with Charley’s brother, Bram. He was only two when their mother left and has felt hurt and abandoned all his life resulting in his getting into trouble and abusing alcohol and drugs. His reaction when he eventually comes face to face with his mother is quite moving and you do really feel for his pain. 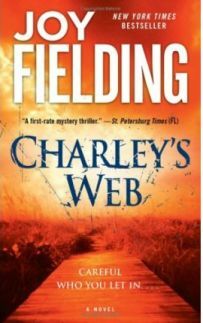 Overall ‘Charley’s Web’ is a well written book which kept my interest from start to finish. I also desperately wanted to find out the identity of Jack and this kept me guessing all the way through. There are always surprises with Joy Fielding and this book was no exception. There is suspense that builds nicely but there is also a whole look more making this, in my opinion, one of Joy Fielding’s best books (and they are all very good!). I really recommend it along with all the others that she has written too. One Comment on "Charley’s Web"